You can achieve your personal fitness goals with a customized program and one-on-one coaching from simply the best instructors! Our knowledgable and caring staff members provide a relaxed and welcoming atmosphere where you will be challenged, but never intimidated. Fitness Center members work one-on-one with a certified personal trainer. Sessions focus on establishing and reaching realistic goals using cardio-endurance and resistance. One-on-One Adaptive Fitness participants are supervised by a certified trainer, and training is based upon input and direction from participants’ therapists. Evaluation and medical clearance necessary. For more information about personal training, contact Fitness Center Director Russell Graham at 908-273-4242, x134. Karen Von Zelowitz, Licensed Dietitian and owner of Nordic Health & Wellness LLC, is offering 1 hour nutrition services available to members for $60. For more information contact Sangeeta Benbow at 908-273-4242, x 133. Mary D’Amato, Personal Trainer and Group Fitness Instructor, is trained as an Assisted Stretch Provider. Target your muscles and joints for greater flexibility, increased circulation, and stress relief. This fully clothed session will complement your fitness routine and healthy lifestyle habits. It can be done in 30 or 60 minute blocks. Vouchers are purchased at Front Desk just like, and at same rates, as Personal Training. Call or visit Mary at the Fitness Center to arrange appointments 908-273-4242 x. 113. Our instructors work one-on-one with members. 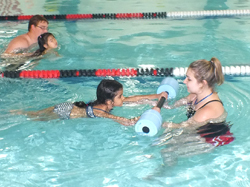 Contact Adult Fitness & Wellness Director Sangeeta Benbow at 908-273-4242 ext. 133 for more information. Email Jeff Porter at jeff.porter@theconnectiononline.org for more information. Designed for anyone who wants to stay in shape, is training for a triathlon or interested in low-impact fitness training. Email Jeff Porter at jeff.porter@theconnectiononline.org for more information.